The Robbie International Youth Tournament Inducted into Canadian Soccer Hall of Fame – Organization of Distinction. 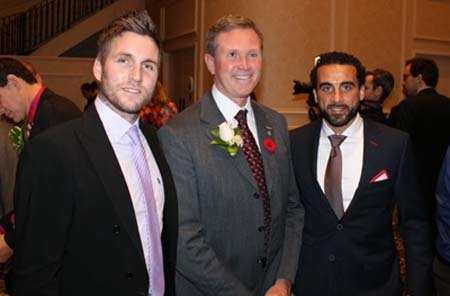 The Robbie was inducted into the Canadian Soccer Hall of Fame at a ceremony on November 9, 2014 attended by the current committee, representatives from Scarborough Soccer, and eight past chairs. The Robbie remains committed to its original objectives: to promote soccer and to raise money for charity. The Robbie International Youth Tournament has been played in Scarborough, Ontario every year since 1967, and has involved both male and female teams from all over Canada, the world and now offers events for players 7 to 18. The tournament is organized by a committee of the Scarborough Soccer Association. The Robbie has hosted well over 10,000 teams and over 200,000 players and has raised $1.7 million dollars that has been donated to the Cystic Fibrosis Canada. The Robbie Tournament has seen the likes of Toronto FC’s Dwayne De Rosario and Scarborough’s Jonathan De Guzman as well as National Women’s Soccer League players and Olympians Diana Matheson and Jonelle Filigno.